Racks and racks of newspapers. Just from looking in the rack’s windows, which would you buy? 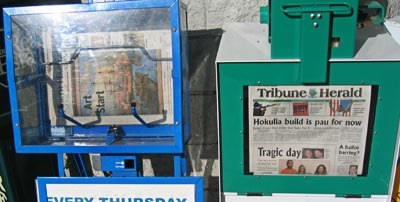 This was at Waikoloa Village Market where there has been a little battle with the folks who fill these racks as to which one is closest to the market’s door. The order from the door to furthest away: WHT daily, WHT Sunday, Tiser, Trib, NHN. Past NHN is a realtor’s freebie. I’ve heard that the vendor who fills the Tiser rack moves it closer to the door, then our person moves it back down the line and so forth.